New Balance Fresh Foam Hierro v3 are neutral trail running shoes. 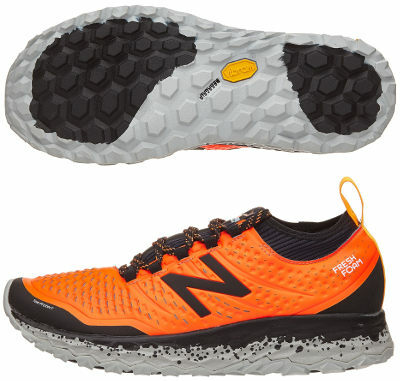 The impressive New Balance Fresh Foam Hierro v3 gets really attractive for off-road lovers and shows the firm intention from New Balance to innovate in competitive trail running shoes market, particularly in long distance (ultra) segment. Current edition increases amount of cushioning in heel area to improve shock absorption and therefore doubling drop up to 8 mm for smoother ride. The Fresh Foam Hierro v3 is a great option to enjoy long distances on dirt tracks (or at least not too technical terrains) with maximum comfort. Although New Balance partly used new HypoSkin fabric in versatile Fresh Foam Zante v4, in current Fresh Foam Hierro v3 complete upper is made of it, leaving forefoot reinforcement "Toe Protect" as the only element which was also available in its predecessor Fresh Foam Hierro v2. Definitely a risky bet from New Balance to premier full upper of new fabric in a trail running shoe which is supposed to last long journeys, we need to wait for feedback from unbiased runners to verify how successful performance will be. The other interesting change is the bootie construction that gets rid of traditional tongue while sock-like collar extends up to the ankle preventing dust and debris from jumping inside. Besides getting thicker in rear side, Fresh Foam™ midsole in Hierro v3 takes advantage from latest developments from engineered geometry already seen in premium Fresh Foam 1080 v8 to improve overall performance, especially softer cushioning and enhanced stability. The other major asset is the Vibram® MegaGrip outsole with bigger lugs and more distance between them to adapt better to different terrains featuring superb traction.